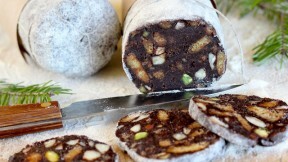 This chocolate salami recipe is an easy, no-bake dessert from Aube Giroux of the Kitchen Vignettes blog. In a small bowl, crack the eggs into the heavy cream and whisk until smooth. Add this to the chocolate mixture. (If you are concerned about eating raw eggs, you can use pasteurized eggs - I use farm fresh eggs and wash the shells well before breaking them). Add the amaretto liqueur to the chocolate mixture and mix well. If you wish, toast the almonds to bring out their flavor. Place them on a cookie sheet in a 350F oven and toast for about 10 minutes (for whole almonds) and 5 minutes (for slivered almonds), checking them a few times to shake them around and make sure they aren't burning. Place the chocolate mixture on a piece of plastic wrap (about 20 inches long) and using your hands, shape it roughly into a log that is approximately 2 1/2 inches thick in diameter, and about 12 inches long. Don't worry if it's a little messy looking. Alternately, you can divide the chocolate mixture into two parts to make two shorter salami logs (about 6 inches each). Now wrap the plastic tightly around the log, twisting the ends snuggly to squeeze the mixture in. Use twist ties to fasten the ends. Roll the log back and forth in the plastic wrap, to even it out and pack it together well. Place in the fridge for at least 6 hours, or overnight. When ready to serve, remove from the fridge and take off the plastic wrap. Roll the log in confectioner's sugar and shake off any excess. If you are gifting it or wish to have the full "salami effect", wrap some kitchen twine around the log, salami-style (this video though in Italian, will visually show you how to do it). You can slice right through the twine when it comes time to serve. After removing from the fridge, allow the log sit at room temperature for 15 minutes before slicing.Using a clean sharp serrated knife, carefully slice into 1/4 inch thick slices, if you're having trouble getting perfect slices, cut them a little bit thicker.